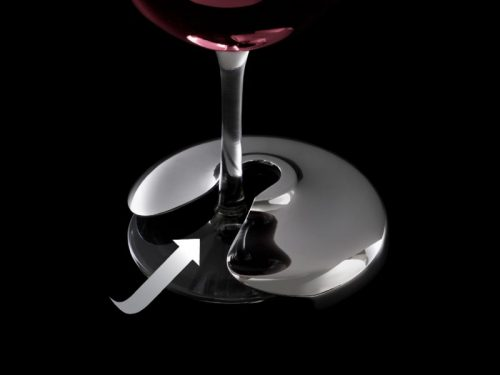 Wine Sitter is a stemware protector that prevents glasses from tipping due to table bumps and gusts of wind. It’s an award-winning design and the ideal accessory for any wine enthusiast or for parties that complements decor. When it comes to accessories for stemware, simplicity and elegance comes in at the top of priorities so as not to detract from the beauty and luxurious feeling of the glass itself. For those with a passion for wine, glassware is a significant part of the experience while enjoying a drink. Whether it’s a tall glass for Cabernet or a broad bowl for Bordeaux, the top-heavy design of a stemmed glass puts it at risk for tipping. A gust of wind, a handsy talker, or distracted guests can easily cause a spill and shatter the glass. The Wine Sitter offers a solution that preserves the beauty of the stemmed glass. The chrome-look finish complements any decor. The inner portion of the Wine Sitter is lined with silicone to protect the base from scratches or nicks when moved. It can be used on any surface and is as easy as sliding the base in and out of the sitter. It’s a simple accessory that can mean the difference between a worry-free get-together or the chaos of broken glass. This is the perfect addition to your dining room set for people who have exuberant dogs with wagging tails or nosy cats, the Wine Sitter also works well on coffee tables or other surfaces. It will also help guard against accidental bumps from clumsy friends or family members. To help pay for the sales and marketing costs associated with bringing Wine Sitter to the market, Dodd recently launched her campaign on the crowdfunding website Kickstarter. There, she hopes to use raise $10,000, which she and her husband will use to finally make Wine Sitter available at retail establishments. The team behind the Wine Sitter is now on Kickstarter and this accessory promises to be essential for any wine-lover. Please check out their new Kickstarter campaign page!